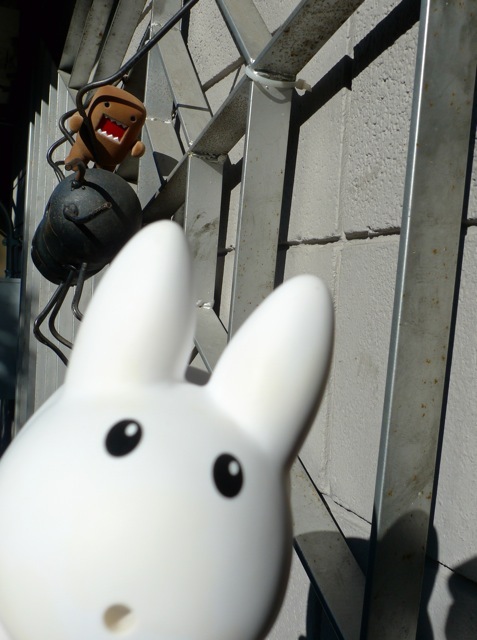 Year of the Labbit: Labbit Travels: Arachnid Invasion! 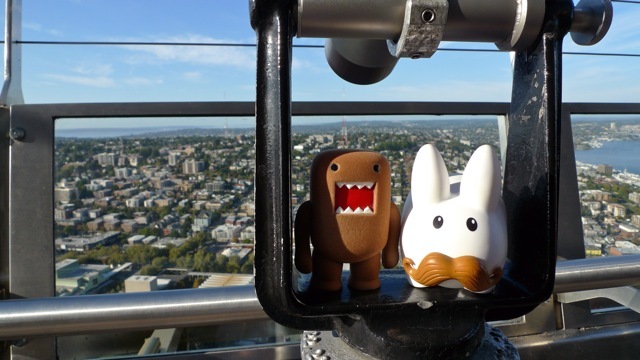 After hanging out at the Seattle Center, Pipkin and Domo took a ride in the elevator up the Space Needle. Eek! What's over there? 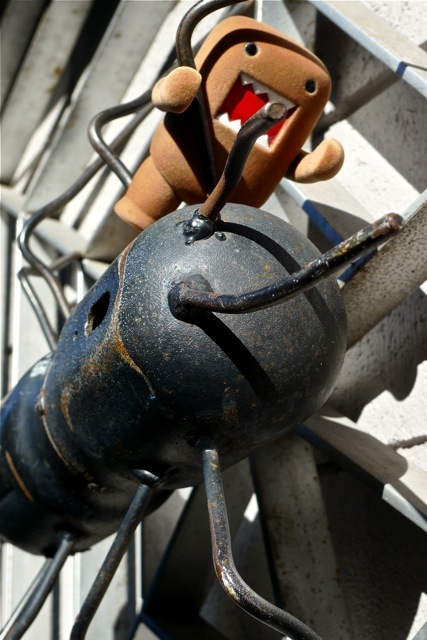 Something's crawling on the roof of the Armory. Something with a lot of legs. Hmm. Maybe they could take a better look from the observation deck. 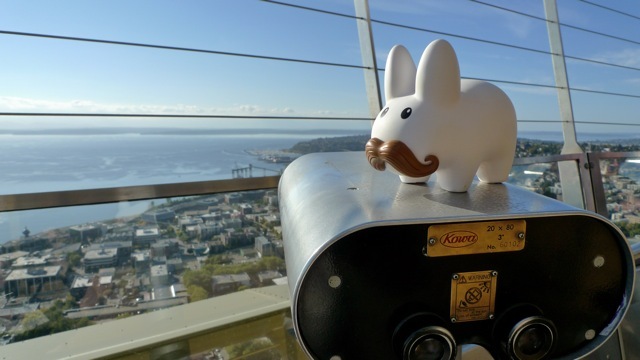 Pipkin climbed on top of some binoculars to take a better look. Hm. Nothing from this side. 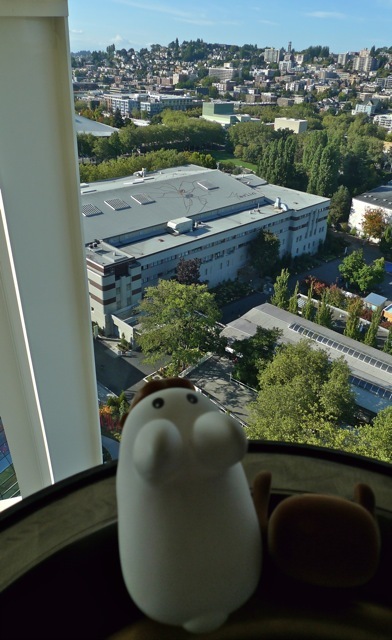 But from here Pipkin could see the rooftop of their hotel, and Puget Sound. It's quite nice up there. They walked to the other side of the observation deck to try and locate the spiders. It stinks when you see a creepy crawly and then you lose track of it. You never know where it might appear next. DAAAAAHHH! Domo spotted not one, but TWO! But they're not spiders, they look like Daddy Longlegs, which Domo explained to Pipkin was not actually a spider (although it is an arachnid) and that its wee fangs wouldn't break human skin. Well...maybe they could, at that size! These guys are giant! 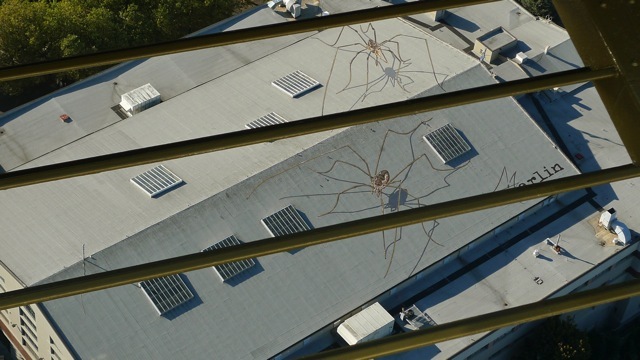 It turns out, these Daddy Longlegs are not a part of some giant pseudo-spider invasion, they're a trompe-l'oeil, a technique of painting that creates the illusion of something being three dimensional. The artist Marlin Peterson painted the two spiders recently on the roof of the Armory, so that it could be seen from the Space Needle. Phew! Pipkin felt a lot better knowing they weren't real. 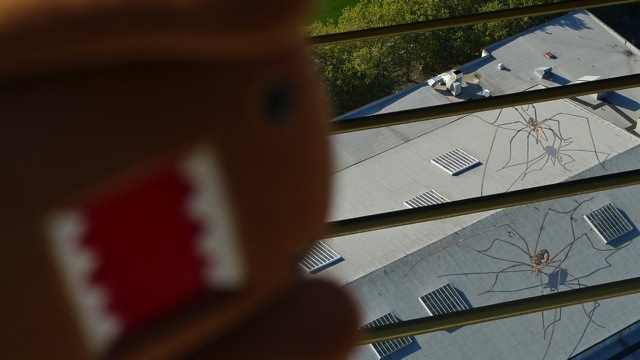 It's okay, Domo's got it under control. What's up, Seattle? Why do you like to scare your visitors? I think it's great that you were there at the right time for the angle of the spider's shadows to match the other shadows. I agree, I was quite fortunate! Makes it seem all the more real. Originally this artist was commissioned to do a mural and I'm glad he was able to do a rooftop instead.